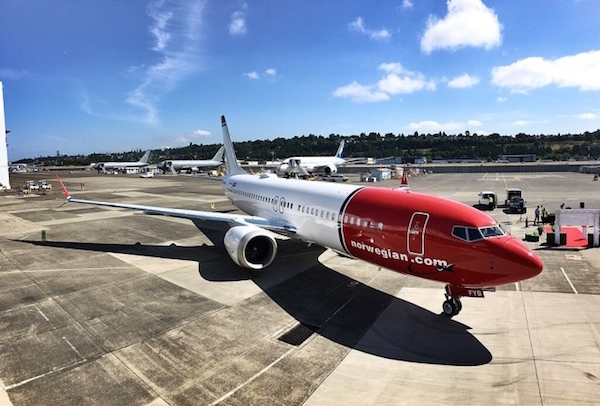 International Airlines Group (IAG) on April 12, 2018, acquired a 4.61% ownership position in budget carrier Norwegian Air Shuttle to initiate discussions with the airline, including the possibility of a full offer for Norwegian. A potential deal could value the carrier at $3 billion with debt, sources say. Shares of Norwegian soared as much as a record 50% on the day IAG announced it may offer to buy the company, and continued to rise on April 13, 2018, up 12.7% by 07:15 GMT, which is the highest level in 15 months, Reuters reports. A potential acquisition could value the company, which has a market value of more than $1 billion, at about $3 billion including debt, sources told Bloomberg. But Norwegian has suffered deep losses with shares lagging behind its low-cost rivals like Ryanair and EasyJet. According to The Financial Times, the carrier suffered a $38.5 million loss in 2017, against a profit of $1.5 million a year earlier – its third year of losses in the last four. The carrier’s struggles, aside from deep losses, also include a $2.9 billion debt. IAG has taken advantage of Norwegian’s financial situation to make its move towards acquisition.